DJI, the world leader in civilian drones and aerial imaging technology, today announced details about its Black Friday Promotion including discounts on the Spark, Mavic Pro, DJI Goggles, Osmo series as well as the Phantom 4 Advanced and Pro. For consumers looking to capture their inspirations and sharing their stories on-the-go, they can enjoy up to USD $100 discount on the Spark and Mavic Pro. 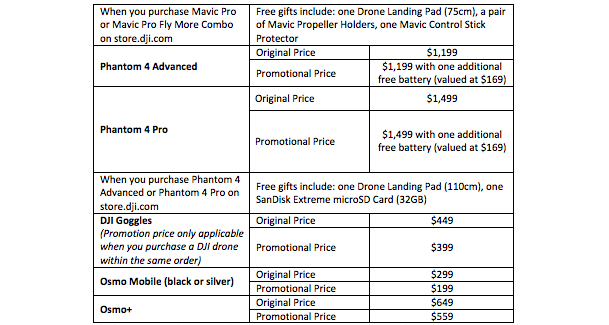 For those who want to get the most out of their Mavic Pro, they can enjoy up to USD $150 discount with the Fly More Combo. Standalone Phantom 4 Advanced and Pro purchases will include an additional free battery, which makes it an ideal option for serious photographers who demand a powerful camera system and extended flight time. For those who want to capture cinematic videos like a professional or experience flight in first-person-view, they can also choose from the Osmo series or purchase the DJI Goggles. Whether you are a photographer, tech fanatic, travel enthusiast or looking to get your first drone, there’s something for everyone. DJI’s Black Friday Promotion will commence on Nov 22 21:00 (PST) and end on November 27 23:59 PST. This promotion is available on store.dji.com, at DJI Authorized Dealers and in all DJI Flagship Stores. Customers who purchase Spark, Mavic Pro, Phantom 4 Advanced and Pro through store.dji.com during the promotional period will receive an additional gift while supplies last. For discounted prices on select products and gifts, refer to the chart below. Check store.dji.com for pricing in local currency. Above prices are subject to change without prior notice. The Mavic Pro is DJI’s first foldable drone, perfect for travelers, photographers and capturing inspiration wherever you go. On-board intelligent features include Obstacle Avoidance, ActiveTrack, TapFly, Gesture mode for selfies, and you can fly with the controller or just your smartphone. It can shoot 4K video and 12 MP photos, with a flight time of up to 27 minutes. The Phantom 4 series is equipped with a powerful imaging system - an 1-inch, 20-MP sensor and a mechanical shutter that is able to shoot 4K videos at 60 fps. Intelligent features include Draw, ActiveTrack, TapFly and Tripod Mode. With highly advanced computer vision and sensing technology, the drone is able to see its environment in 3D and allows for more precise and accurate control. It has a maximum flight time of up to 30 minutes. Experience seamless FPV flying with the ergonomically designed, comfortable DJI Goggles. Its ultra-high quality screens, long-rage, low latency wireless connectivity and direct control of photo & video capture, allows you the experience flight in a whole new way. The head tracking feature and Fixed Wing Mode also simulate a realistic FPV flying experience. The Osmo Mobile turns your smartphone into a smart motion camera, making every moment you shoot look smooth, professional and ready to share. To get up close with your subject, the Osmo+ is DJI’s first handheld gimbal with an integrated zoom camera that will give you more control over your composition. Capture and share moments more easily and more cinematically than ever with the Osmo Mobile and Osmo+. Promotion timeframe may vary based on local time zone and operating hours of each flagship store.